Specialized savings accounts, informally referred to as 529s, should be at the top of your list because they offer preferential income and/or estate tax treatment. In fact, according to Sallie Mae’s “How America Saves for College 2015,” parents with a 529 plan save 89% more than those simply using a savings account. Here are a few advantages that parents and grandparents may want to consider. Assets contributed to a 529 on behalf of your designated beneficiary grow tax-free. Even better? The withdrawals are tax-free as long as they’re used for a qualified education expense, such as tuition, room and board, and supplies, and don’t exceed the actual costs. Most 529s are state-sponsored, which could provide additional tax savings. Unfortunately, California is one of seven states with a state income tax, but does not offer a deduction for contributions. If you are a resident of another state it’s important to understand which tax deductions or tax credits may be available. For example, some states offer a tax benefit to residents who invest in their state’s plans. Others allow a state income-tax break if you contribute to any state’s plan. We can help you compare potential deductions. Many people worry that gifting large chunks of money to a 529 means they’ll irrevocably give up control of those assets. Hard to swallow, when you’ve worked hard to build your net worth and can’t predict if you’ll need that money later. The good news is that 529s allow quite a bit of control, especially if you title the account in your name. At any point, you can get your money back. Of course, that means it becomes part of your taxable estate again, subject to your nominal federal tax rate, and you’ll have to pay an additional 10% penalty on the earnings portion of the withdrawal if the money isn’t used for your designated beneficiary’s qualified higher education expenses. What if your beneficiary receives a scholarship or financial aid? Well, you’ve got options here, too. Third, you can take the money and pay the taxes on any gains. Normally, you’d expect to pay a penalty on the earnings, too. But that’s not the case for scholarships. The penalty is waived on amounts equal to the scholarship as long as they’re withdrawn the same year the scholarship is received. Of course, you can always use the funds to pay for other qualified education expenses, like room and board, books and supplies, too. A grandparent, or anyone really, can contribute up to $14,000 a year per person ($28,000 if married filing jointly, for 2017) with no gift tax consequences. Better yet, if you can swing it, you can “super fund” your 529 using the five-year accelerated gift election, a lump sum gift of $70,000 per contributor ($140,000 for married couples). The catch here is that you can’t make additional gifts for the next five years, but your larger gift now has the opportunity to compound tax-free over a longer time. Lastly, it doesn’t matter how much you make, you can contribute to a 529 for anyone of any age, including yourself if you plan to go back to school. And lifetime contributions are generous as well. Depending on the state, you can contribute more than $200,000 to help your future learner avoid or minimize student debt. You can avoid gift taxes altogether if you make tuition payments directly to a higher education institution even after you’ve reached your annual federal gift-tax exclusion limits. Doing so doesn’t chip away at your lifetime gift exemption either, but it is likely to adversely affect financial aid applications. Most Americans supplement their contributions to college expenses with financial aid of some sort, but aren’t quite sure how college savings could affect future aid. There are some things to consider with 529s. You have to decide how to title the account – who will own it and who will be the beneficiary. Is it better to own the 529 plan and make your child or grandchild the beneficiary or to put the 529 plan in the beneficiary’s name outright? Another option for grandparents and aunts and uncles is to contribute to an existing 529, opened and owned by the child’s parents. The difference is how the distributions will be treated when it comes to seeking financial aid using the common Free Application for Federal Student Aid (FAFSA) form. The FAFSA form is the key to unlocking some portion of $150 billion in available federal tuition assistance. No reason to leave money on the table if it could be better deployed to achieve your own goals, right? These decisions can be complicated, and we can offer some helpful advice beyond the basics offered below. In this case, 5.64% of the assets in the 529 plan will be counted toward something called the Expected Family Contribution (EFC). That amount is recalculated each year based on the end value of the account, which will steadily decline since funds will be used to pay for education expenses. If the student owns the account, 20% of the balance counts toward the student’s expected contribution. That’s the case for any student-owned assets, so it’s important to title assets appropriately. Technically, if the account is owned by someone other than a custodial parent or student, such as a grandparent, it is not counted for financial aid purposes. However, the distributions are. FAFSA treats the distributions as the student’s income – even if it’s a qualified tax-free distribution for income-tax purposes, so this has the potential of limiting the value of your gift. However, this may be avoided by delaying 529 distributions until after the student has completed his or her FAFSA application for their junior year or later. FAFSA calculations consider income from what’s called the prior-prior year – for the 2017-2018 FAFSA that would mean using your 2015 tax return – so the income from distributions won’t be a factor toward the end of a college career. Not every institution relies on the federal financial aid form. Some use the CSS/Financial Aid Profile from The College Board instead, which reports and treats 529 assets as available assets, regardless of how they’re owned. Saving for college doesn’t have to be daunting, just disciplined. It helps to take advantage of investment vehicles designed to help you along the journey. Each has its benefits and considerations, so it’s wise to talk to a professional advisor before making a years-long commitment. For example, 529s, like many other investments, come with fees and are subject to market fluctuations, unless you opt for a prepaid account. And you can only make changes to your asset allocation twice a year. Talk to us to see if 529s are the right way for you to give the gift of education – whether it’s for a child, grandchild, family friend or even yourself. 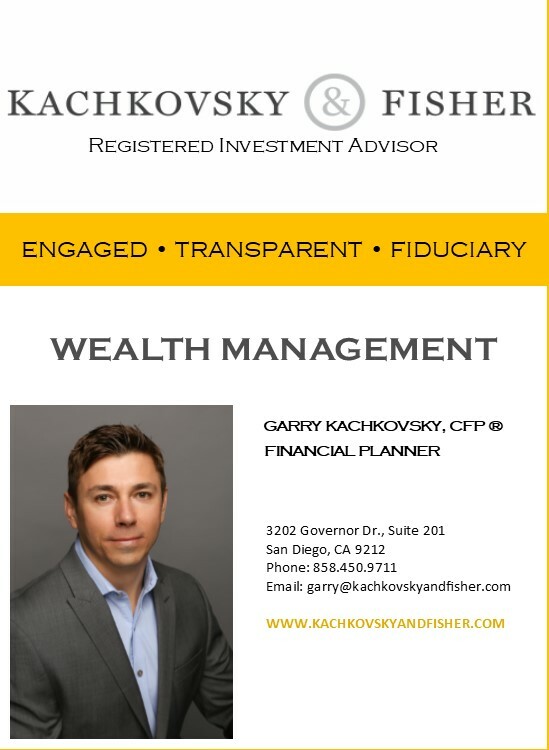 And, if you have questions regarding any other aspects of your life that revolve around money, give Garry a call at 858-450-9711 or email at garry@kachkovskyandfisher.com. Earnings in 529 plans are not subject to federal tax and in most cases state tax, as long as you use withdrawals for eligible college expenses, such as tuition and room and board. However, if you withdraw money from a 529 plan and do not use it on an eligible higher education expense, you generally will be subject to income tax and an additional 10% federal tax penalty on earnings. An investor should consider, before investing, whether the investor’s or designated beneficiary’s home state offers any state tax or other benefits that are only available for investments in such state’s qualified tuition program.